This project is a Masterpiece. 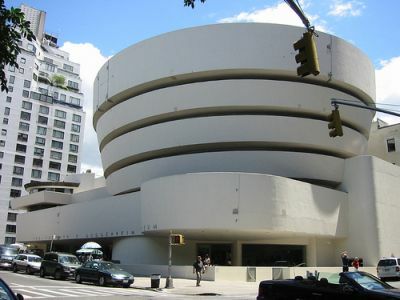 It was designed by the Great Architect Frank Lloyd Wright in the early forties. Althought the design process started in 1943, Wright’s inverted-ziggurat design was not built until 1959. There were a number of reasons for the delay. Architect Wright had to produce six separate sets of plans and 749 drawings before one was finalized. 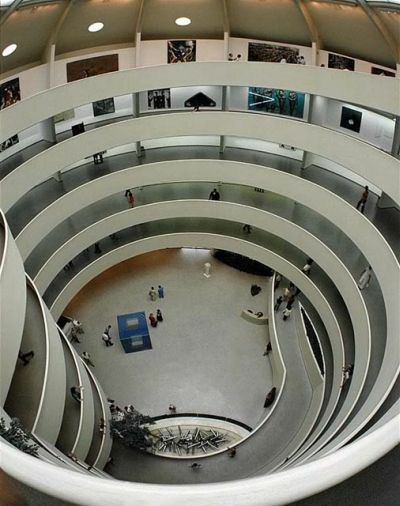 The Solomon Guggenheim Museum was constructed to display the collected works of Guggenheim – his sculptures, paintings and pictures. In order to give a completely original form for the building, Wright invented a radical new shape for it. 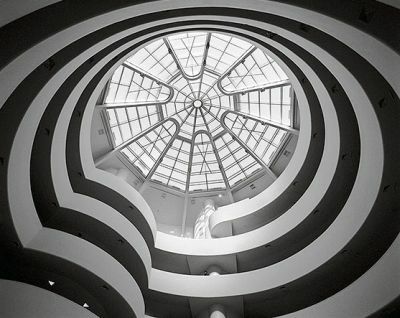 The seven-storey building that he developed has a spiral form around an open well, with a huge skylight as a roof. Wright’s purpose was to develop a new kind of museum in which each work of art did not merely form the part of the wall but stood out on a slightly curving surface. The unique feature of this design is that while looking at any one painting, all other paintings are always visible, since the whole exhibition can be seen at any point on the ramp. He gave special importance to lighting. By using both daylight and artificial light, a three dimensional effect was created. The individual storeys project outwards at each level. The paintings are planned so that they hang on the external skin which follows the spiral. The circulation pattern is very simple. Visitors are taken up to the top floor by lift directly upon entering the museum, then they walk down the gentle slope of the spiral ramp on the ground floor, viewing their exhibits on their descent, with changing colours and forms. There is a library and a book shop on the ground floor. The circular form of the spiral adds to the sense of movement. The museum’s administrative office is in a separate building to the north, which is also spiral shaped. The main construction material is concrete in a variety of forms such as reinforced and sprayed concrete, as the spiral ramp design depends on the character of the material. The circular, inverted, and truncated conical main space is lit by a dome and a ground floor is left as an open circular court. A single, self-supporting, reinforced concrete spiral beam forms the structural system. The flat beam acts like a continuous ramp. This ramp is the architectural space. Wright’s concept is three-dimensional and links the visitor, the picture and the environment into a single unit such as structure, space and circulation come together to form a tremendous unity. The continuous seven-storey ramp is based on the principle of the unbroken wave. This entry was posted by Benzu JK on December 18, 2009, 7:11 pm and is filed under Architecture. You can follow any responses to this entry through RSS 2.0. I don’t think you can classify Frank Lloyd Wright as an great architect as he was not trained as an architect he was trained more as a structural engineer. Same could be said for Calatrava. But both of them produced masterpieces that makes us architects envy them. I have visited it and would return again, one of a kind experience.